The Pilgrim Statue of Our Lady of Fatima will be in the San Diego area beginning this Friday, January 4. The statue is a replica of the one at the Fatima Shrine in Portugal, and it was made under the direction of Sister Lucia. It is one of the most famous Fatima statues. Here are the schedule and some links for more information. 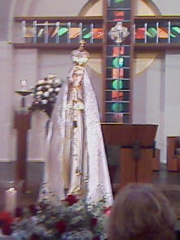 The schedule shown here was found on the website International Pilgrim Virgin Statue of Our Lady of Fatima. An article in the San Diego Union-Tribune also provides a schedule and information about the three week tour. In addition to checking the parish website or bulletin to make sure this schedule is still current, you may send an e-mail to Thomas McKenna to request a schedule for the San Diego events. Friday, Jan 11 St. Thérèse of Carmel, 4355 Del Mar Trails Rd, Carmel Valley, 8:00 AM to 9:00 PM (8:00 AM Mass, 7:00 PM Benediction). A schedule for the day is available for download on the parish website, including morning Mass, veneration, a talk about the statue, enrollment in and distribution of the Our Lady of Fatima Scapular, a visit to a school from 11:00 a.m. to 3:00 p.m., further veneration, and a benediction and candlelight procession. Sunday, Jan 20 2:30 PM Benediction and Procession from St. Joseph Cathedral to the Family Planning Associates Abortion Center. Bishop Salvatore Cordileone will be presiding. The website of St. Thérèse of Carmel, one of the parishes that will display the statue for veneration, has a beautiful page with more information about the visit to that parish and a schedule for the day. I have not checked to see whether other parishes have similar schedules. However, it may be a good idea to check the parish website or bulletin before going. At St. Thérèse of Carmel, for example, although the statue will be there all day, it will be at a school for 4 hours of that time. The diocese has a web page with links to parish websites to make it easier to find parish online information and phone numbers. The International Pilgrim Virgin Statue website has much more information. California Catholic Daily also has an article about the visit.